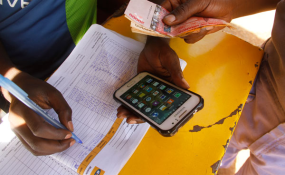 ICT and National Guidance Minister Frank Tumwebaze says that the decision meant that Uganda's drive towards achieving a cashless economy remained on track. Police in Katakwi, Eastern Uganda has arrested three journalists for covering a demonstration by local mobile money operators who were protesting against the newly introduced tax on mobile money transactions, saying the tax was too high and killing their business. The journalists were asked to share their recorded material and also reveal the particulars of the organisers of the protest, an order they declined. Elsewhere in Apac district, another journalist, Moses Okello, working with Radio Devine was assaulted by a group of the ruling National Resistance Movement party supporters led by a one Okutu Denis. Okello was covering rowdy youths at the elections of the Youths and Special Interest groups at Apac Mayor' Garden. "I first interviewed the NRM youths, and then crossed over and interviewed the Uganda People' Congress youths who were running for the different post. The NRM youths confronted me questioning why I was interviewing those UPCs. They confiscated my recorder and hit me on the neck. I am feeling a lot of pain and have reported a case of assault and theft at police." Okello told HRNJ-Uganda. "These are gross violations and abuses of the journalists' rights which must be condemned and the perpetrators brought to book. We will follow up the cases in pursuit of justice for the journalists." Said the HRNJ-Uganda Executive Director Robert Ssempala. This article was originally published on hrnjuganda.org on 13 July 2018.